My dog, had to borrow a kid though, mine were both a little too old for this one. Oh he does look like a marshmallow. This is a hard time but later you will look at the pictures and will smile through the tears. Hugs to you! Bye Max. I know some splendid dogs who will be happy to see you. Oh how adorable! This would make an excellent card. Jejeje� I know that pose! Love the true expressions you captured here. Both of them have their own agenda - and it shows. Great shot, I just wish their feet were not all cut off. great comp, bokeh, colors seem a bit drab. 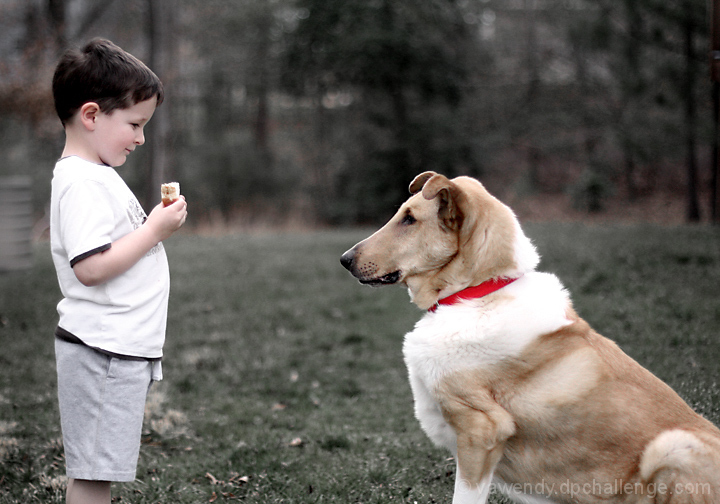 Really cute interaction between the boy and the dog... the kids expression is awesome. Haha! Such a cute idea! I love the emphasis on the child and what he's eating- and why the dog is staring. Adorable! I wish I could train my dog to sit while I eat. Good use of the whole screen. Proudly hosted by Sargasso Networks. Current Server Time: 04/21/2019 03:00:57 PM EDT.